A 21-year-old man accused of murdering his ex-partner and her mother has appeared in court. Janbaz Tarin, of Evelyn Road, Sparkhill, Birmingham, is charged with the murder of 22-year-old Raneem Oudeh and Khaola Saleem, 49. The mother and daughter were found stabbed to death outside their home in Northdown Road, Solihull, on 27 August. Mr Tarin spoke only to confirm his name at Birmingham Crown Court and was remanded in custody. He was arrested in Sparkhill on Thursday after a police manhunt. Mr Tarin is expected to appear again on 30 October for a plea hearing, and a provisional trial date has been fixed for 4 March. Judge Paul Farrer QC said the trial was estimated to last three weeks. 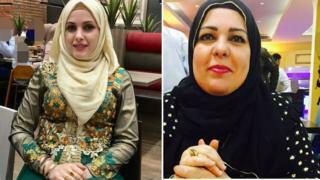 Ms Oudeh and Mrs Saleem were buried on Tuesday after a joint funeral service at at Ghamkol Masjid in Golden Hillock Road, Small Heath.